As said above, one of the most critical keys is to continue reading to them long after they have learnt to read themselves. When reading to your child, do a little picture walking on each page. That is, describe and talk abou all that you see in the pictures. This helps the child’s attention and ability to think for themselves, and will also give them clues as to the storyline of the book. The goal isn’t to complete as many books as possible. Take your time and periodically stop and talk about something in the book, particularly if it relates to anything from your real lives. For example, if the story contains a dog character, stop and talk about how his behaviour is similar to that of your own pets, if appropriate. 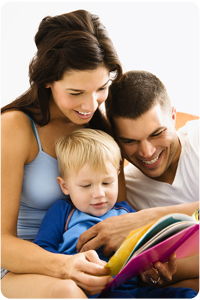 Reading your child’s favourite book again and again creates pleasure and is a positive association between your child and the act of reading. Encourage it! Challenge your children. Aim for 1-2 years above their current reading level. This will expose your child to new words and phrases, that will hopefully keep them more engaged than a book that doesn’t challenge them intellectually.